Well designed, built and thought-through. Summary : Overall – if you’re looking for a large family tent, the Nemo Equipment Wagontop 8p is an excellent choice. Sometime around the middle of May, I decided that I was going to take my entire family of four camping for Fourth of July weekend. My wife, my six year old son, my three year old daughter and our two dogs. This would be the weekend that the four of us, as a family would sleep in a tent for the first time. 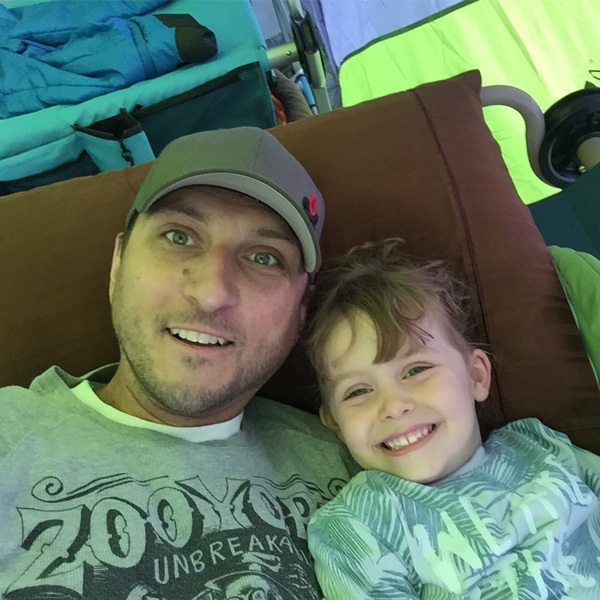 My wife and I have been camping together since we started dating – and my son and I have had countless adventures under the stars. When my daughter was less than one year old, we rented a pull-behind camper and took her for a weekend of fall camping. Although we all made it home alive, the sleepless nights of crying prevented us from taking our outdoor overnights to the next level. I decided that we were finally ready. If we were going to make this work, I knew that I had assemble the ultimate kids campsite. This meant: flashlights and lanterns for everybody, a set of bunk-cots for the kids, more warm clothes than we knew what to do with – and of course, a tent built for a family. 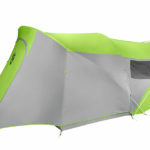 I’d been looking for the perfect opportunity to test out the NEMO Equipment Wagontop 8p Tent – and I knew this was it. I hope you enjoy my review below. 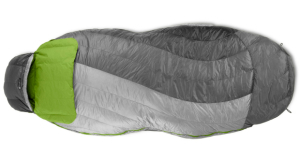 The NEMO Equipment Wagontop 8p Tent comes ready to hit the road in a compact zipper-topped carry bag. 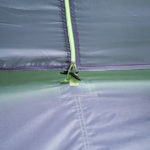 I’ve had poor experiences (as I’m sure many have) with “perfect fit” cinch-top tent bags that usually only fit the tent correctly once – when it’s taken out of the package for the first time. The Wagontop 8p both came out of, and went back into the bag perfectly. 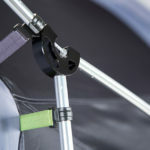 In addition to the zipper, the bag itself features heavy plastic clips that can be cinched down making for a compact package. 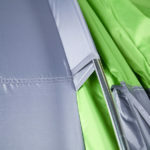 The tent itself features a truly unique pole configuration. 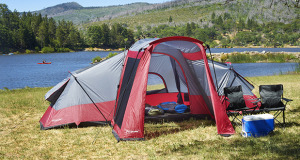 With a total of three poles, the Wagontop 8p expands into a truly standing-height tent. Although the kids didn’t have any problems what-so-ever, I found myself enjoying the extra height (I’m 6’3”) and could maneuver around the tent with ease. 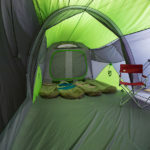 Not only did the tent stand tall, but the interior space was more than roomy enough for both the people and the dogs. 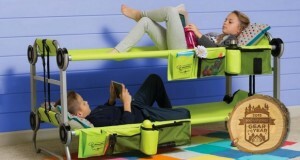 Like I mentioned earlier, I had setup both a pair of Disc-O-Beds as well as a set of Kid-O-Bunks inside – and everyone had plenty of room to move around. 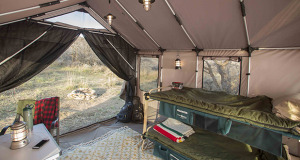 One of the features that I found most appealing, especially on a buggy mid-July weekend was the oversized screened in front “porch.” This area of the tent actually serves a dual purpose, with its own incorporated rain fly. 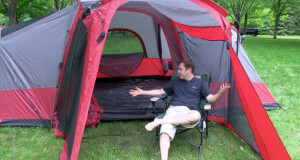 You have the choice of either enjoying the open air, or expanding the size of the tent for more living space. We chose the later – which left plenty of room for my daughter to play dolls before bed. 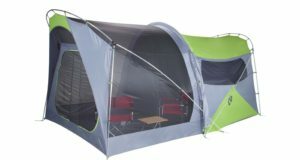 The Wagontop 8p features large screen windows on all four sides of the tent, which made for excellent cross-ventilation at night. On the second night, we decided to close up all of the windows, as there was a chance of heavy rain overnight. 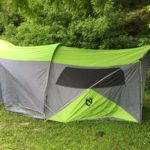 My wife went out of her way to comment about how dry the tent was the next morning, as it hadn’t succumb to the typical damp interior of our other tents. Definitely a bonus! 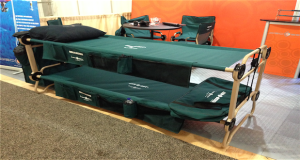 The NEMO Equipment Wagontop 8p tent looks cool. The tents namesake definitely says it all, with a rounded arch holding the canopy on both ends. 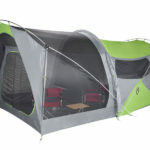 The tent’s lack of pitch, is what provides the standing height feature that I mentioned above. 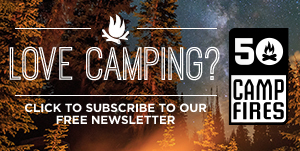 The three pole construction makes for a tent that is truly unique, and easy to find at a dark campground! 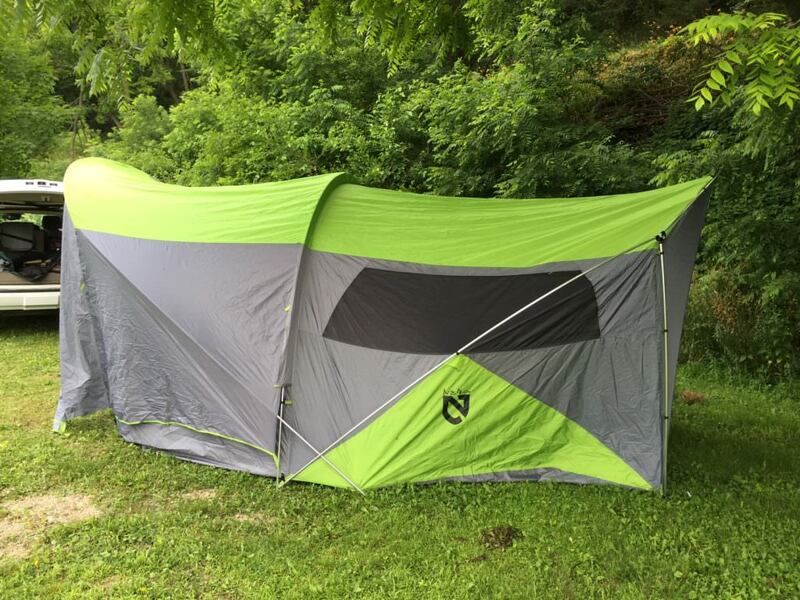 The NEMO Equipment Wagontop 8p tent is really well built. From the seams to the poles. To be honest, I was even impressed with the stakes that the tent came with directly out of the box. 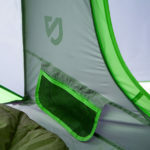 I believe that a lot of attention to detail went into both the design and construction of this tent. 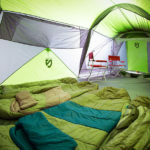 A tent should be an investment – poorly built tents that are falling apart after a few uses aren’t an investment – they’re a liability. The NEMO Wagontop 8p is built for years of enjoyable use. 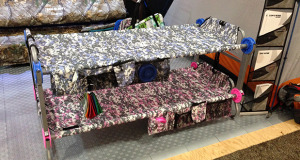 The NEMO Wagontop 8p is priced at $699.95 which is a great value for a tent of this size and quality. 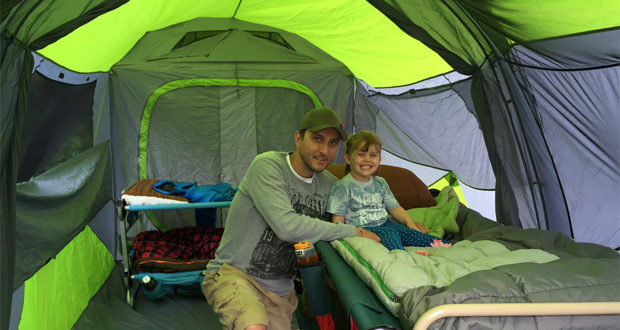 Overall – if you’re looking for a large family tent, the Nemo Equipment Wagontop 8p is an excellent choice. Although I haven’t had a chance to try them out, the Wagontop also comes in a 4 person and 6 person model as well – which I’m sure will live up to the standard of the model I tried out.